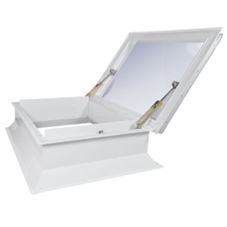 Xtralite have developed a range of modular natural and smoke ventilation AOV rooflights to specifically mimic the standard range of Xtralite’s modular rooflights. This gives specifiers the opportunity to maintain the external aesthetics of the building by having rooflights and smoke vent AOVs supplied from a single source. Xtralite AOV’s are CE Marked to EN12101-2 and can be glazed in glass or polycarbonate alternatively they can be supplied with a solid lid. High capacity ventilation. Glazing rises vertically for greater stability whilst providing large areas of natural ventilation. For use in areas where space is of a premium but large areas of ventilation are required. Can be glazed in glass, polcarbonate or supplied with solid lids. X-Jet Louvres are CE marked to EN12101-2 and come with metal, glass or polycarbonate blades.